Mister Rogers arrives with a lyre that is missing a string. As he is leaving for Negri's Music Shop to have the instrument fixed, Mr. McFeely stops by with a Speedy Delivery t-shirt. After Mister Rogers puts on the shirt, he and Mr. McFeely head to Negri's Music Shop. At the music shop, Joe Negri shows several instruments which are in need of repair. 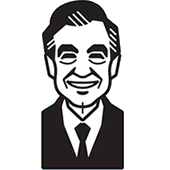 While at the shop, Mister Rogers meets Earl Grollman, a children's counselor with a book about divorce. Mr. Grollman talks about how he helps children understand their feelings during difficult times. In the Neighborhood of Make-Believe, Lady Elaine tries to convince Prince Tuesday that he should live with her since a divorce of his parents seems inevitable. Harriett Elizabeth Cow helps Prince Tuesday to understand that he should share his feelings of worry with his parents. At the castle, Prince Tuesday explains his fears to King Friday and Queen Sara who have come to an agreement on the jet plane issue. Upon learning that the plane company also makes electric cars and t-shirts, Queen Sara comes up with the idea of an electric plane. The royal couple also sets the record straight -- they are not getting a divorce. Back at the house, Mister Rogers sings I Like to Be Told before Mr. McFeely returns Mister Rogers' newly repaired lyre. After presenting Mister Rogers with a Speedy Delivery t-shirt, Mr. McFeely shows the same shirt in a few other colors. As he pulls the second one from his bag, an orange/yellow color, Mister Rogers subtly mentions being colorblind as he comments, "I don't see colors very well." Speaking of the t-shirt, Mister Rogers seems especially proud of his as he wears it for the duration of the episode and is quick to show it off at Negri's Music Shop. Unlike other episodes from the post-1979 era, the opening does not show text of the week's topic.